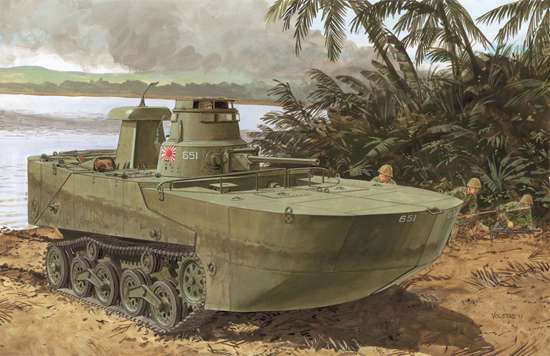 TYPE 2 KA-MI W7floating pontoon IJN LATE PROD. The “Ka Mi” was the first amphibious tank used by the Imperial Japanese Navy (IJN), and it was designed for Japanese landing forces performing amphibious invasions of Pacific islands sans regular port facilities. Production of the Type 2 commenced in 1942 and a total of 184 amphibious tanks were made, although the design was too late to participate in Japan’s island-hopping campaign. When used in water, large pontoons were attached to the glacis plate and rear deck to give it a top speed of 10km/h in water. These pontoons could be shed as soon as the vehicle reached land. Dragon’s previous kit featured an Early-Production set of pontoons, while this newest kit offers Late-Production pontoons. The front section of pontoons is new toolings and is composed of two halves specific to the Late-Production type. Other parts such as the conning tower, rudder and hydroscope suitable for its amphibious role are also fully detailed. Slide molds are widely employed, with upper-hull and lower-hull components both made as single pieces, for example. The kit is closely based on measurements taken from a surviving Type 2 tank on Palau to ensure this kit is accurately dimensioned. The “Ka-Mi” also includes DS tracks for easy assembly of the complicated track links. This version with amphibious kit offers so much more by allowing modelers to place it in a scene where the tank is wading ashore.